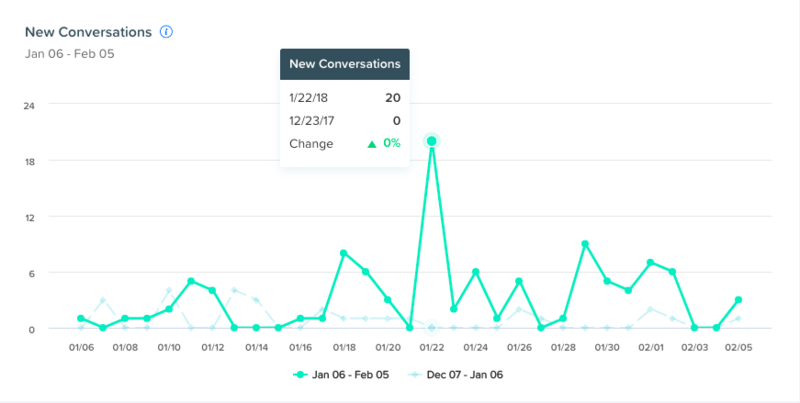 You can see where on your site the most conversations are started, what time of day is most popular for chatting in, and much more in your conversation stats dashboard. You can view the statistics for all of your conversations by navigating to the conversation view and clicking on the "Reports" button in the upper-right corner. There are three tabs of information available on the Reports page - Conversation Volume, Team Performance, and Routing Rules. We don't count email conversations in these stats. Any conversations that are started by emailing your Drift inbox will not count toward overall numbers. These are metrics related to your conversations in general - when they're started, where they're started, and who they're routed to. The timeframe of this report can be changed to show for conversations from this week, last week, this month, last month, the last 30 days, or a custom range. There are also a set of advanced filters that can be applied, such as filtering by bot participation, widget status (online/offline), and which teammate responded to the conversation first. In addition to the three Bot Participation filter options, there's another category of conversations that receive no response. This category will account for differences between the total number of new conversations and the sum from each of the 3 Bot Participation filters. This chart shows how many new conversations were started each day over the selected timeframe. Hover your mouse over the line at each day to show exact numbers and the percentage difference between this day and the same day the previous cycle. Can I export this report? Yes, to a CSV! It will show you each conversation's: ID, Conversation Link, Status, Date Closed (24H), First Agent to Respond, Agent Name, End User, End User Email, Region, Country, Agent First Response Time, Playbook ID, CQL Score, Lead Stage, Tags, Page URL, and Bot Participation (Bot Only, Bot Assisted, or Human Only). 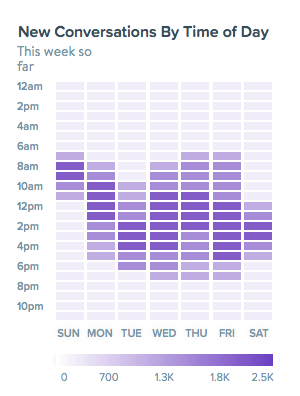 This heat map shows what times of the day are the most popular for new conversations. A darker color means more conversations are happening in that hour-long window. You can hover your mouse over the specific time block to see exact metrics. Can I export this? No. Where are new conversations happening? This lists the top 10 URLs site visitors are on when a conversation is started, from most frequent to least frequent. You can search your different URLs, as well as export a CSV with conversation counts from every URL a chat has been started from. Who's responding to the most new conversations? This lists the top 10 people on your team in order from most to less first responses to new conversations. You can export a CSV with a complete list and conversation counts for each team member. How are conversations being tagged? This report shows you how many times tags have been applied to conversations and how (either by your agents or the bot!) You can export a CSV with a complete list of your tags, the number of new conversations they were applied to as well as see the percentage of new conversations the tag was applied to. These are metrics about your team's interaction with visitors - how long it takes them to respond to a chat and how long chats last. We use median (the middle of a frequency distribution) and not mean (the sum of values divided by their number) in these metrics to avoid outliers skewing your results. The timeframe of this report can be changed as well as whether the report includes all conversations, human only conversations, bot assisted ones, and bot only ones. This statistic has been updated since its release. Previously, this was the time between a user's first message and the human's response, without accounting for the time the user was interacting with the bot. Our response time was measured from the timestamp of message 1 to the timestamp of message 4. This often skewed statistics, especially when a user took a while to respond to the bot and have their conversation routed. With the previous measuring system, our response time was actually using the difference between message 1 (the user's first response to the bot) and message 3 (the agent's first response.) In the updated system, it is now only using the time from message 2 to message 3, giving your reps a much more fair metric to work with. This metric indicates the median amount of time that passes from when a conversation is opened to when a member of your team closes it. You can hover your mouse over individual days to see exact metrics. This lists the members of your team - you can sort the list by median response time, median conversation length, and number of new conversations, in increasing or decreasing order, by clicking each metric. You can also export a full list as a CSV. This tab delivers a full report on where your conversations are being routed. You can change the timeframe of the report in the highlighted box below. When you first click on the routing rules tab, you'll see a quick overview table of the different routing methods and how many conversations have been routed via each type. Manually joined conversations are ones that initially had no participants that a team member joined. Direct Message routing occurs during ABM routing, site visitors chatting in via a team member's Drift profile, conversations started via Live View, and conversations from outbound email greetings. Click through to see a breakdown by each method. Routing that occurs because a visitor reached a goal in a playbook. Clicking through will show a breakdown by playbook, and clicking a playbook name will show details by goal. To view the details of how many conversations were routed to each team member, simply click a rule name. To navigate back, click "Routing Type" above "Participants." You can also export your conversation data (minus the messages themselves) in this section. Note that we've updated one of the columns from "Date created" to "End user first response." So in the case of end users responding later to bot playbooks, for example, the "start time" of the conversation won't be when that bot message sent out, but rather when the site visitor responded. Our query for conversations by date has always worked this way, but now we represent it properly in the export. Want to update your routing rules? Click here!